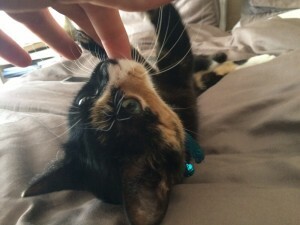 With her model good looks and sweet nature, 10 month old tortoiseshell cat Pooja (formally known as Catwalk Queen) commands the attention of a room with her mere presence. For owners James and Antoanela it was her poise, elegance and demeanour which made them realise they found the cat they were looking for. Having looked to adopt a cat for some time, James and Antoanela decided the best way to find the perfect addition for their family was to meet the cats available for adoption. So one fateful day in November 2015 they made their way to the Home’s North Melbourne shelter to meet the cats in the fur. “We had been checking out the cats available for adoption online, but after looking at their photos and reading their profiles we couldn’t decide on which one was the right one for us. 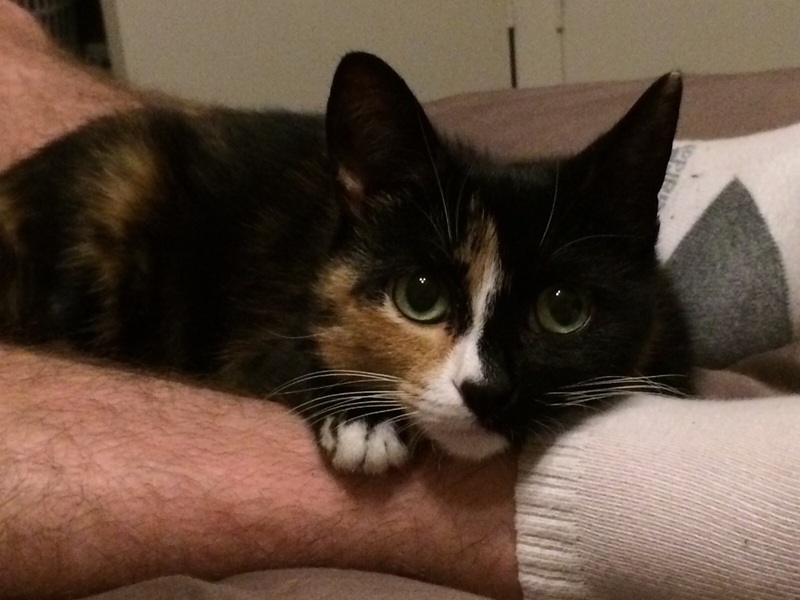 “The decision was made to go into the shelter and meet the cats available for adoption; we felt the best way to decide was to interact with the cats at the shelter, the right one would ultimately choose us and she did,” explains James. Drawn to her exquisite bone structure and beautiful two toned face, James and Antoanela knew they had found the cat they were searching for. Now settled into her new home, James and Antoanela have enjoyed getting to know Pooja and finding out the stunner’s hobbies and interests. “Pooja is very affectionate and loves being around us, but from time to time she’ll also enjoy taking time out for herself. “We are amused and surprised by most of the things she does; she is able to easily entertain herself by chasing flies or playing with a piece of rope. For James, anyone looking to introduce a cat or dog into their lives should consider adoption from an animal shelter such as The Lost Dogs’ Home. “Having a cat gives you a chance to slow down a little after a day’s work and marvel at what amuses them, not take things so seriously and de-stress. “Cats are a great excuse for adults to be silly and playful and adopting gives cats a second chance. Are you ready to adopt a cat into your own family? Adopt your own Pooja by viewing our cats already available for adoption here.